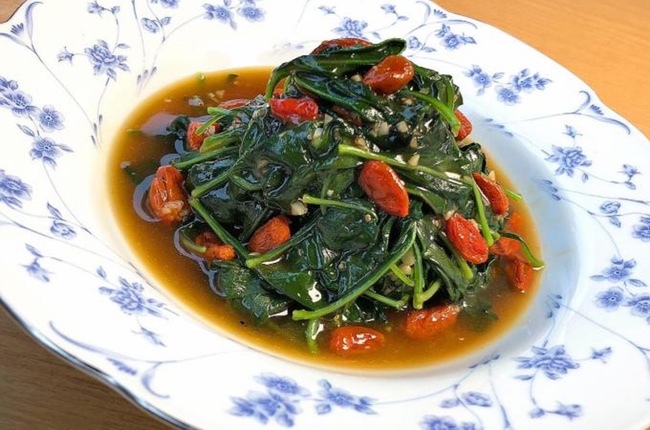 Liven up your table with this simple dish of stir-fried wolfberry leaves. Wolfberries are believed to be beneficial for the eyes, liver and kidneys in traditional Chinese medicine. Wolfberry leaves are also edible and you can find stalks of the plant at the wet markets. Unlike the wolfberries which are sweet, the leaves have a trace of bitterness that not everyone may take to. But I have loved the leaves since childhood. My grandmother and father used to cook them in a soup with egg, wolfberries and ikan bilis. The wolfberry leaves contain beta-carotene, betaine (beneficial for cardiovascular health), calcium, choline, vitamin B1, B2 and vitamin C.
I like to stir-fry wolfberry leaves with wolfberries, seasoned with oyster sauce. It is easy to cook and it makes a nice change from the usual caixin or kailan stir-fries. The leaves wilt very quickly once they get into the wok so you don't have to fry them for long. The only inconvenient part is having to pluck the leaves off the thorny stems. 1. Remove the leaves from the stalks. Discard the stalks. You should get about 220g of leaves. 2. Wash and rinse the leaves. Set aside in a colander to drain the water. 3. Rinse the dried wolfberries and set them aside in a bowl for 15 minutes. 4. Heat 2 tablespoons of oil over medium-high heat in a non-stick wok. 5. Add the chopped garlic and fry for 30 seconds until fragrant. 6. Add the wolfberry leaves and stir-fry for 30 seconds or until the leaves are half wilted. 7. Add the oyster sauce and stir-fry for 15 seconds, then add the wolfberries. 8. Mix the cornflour and 100ml of water. Add this cornflour mixture into the wok. 9. Stir-fry for 15 seconds, until you see the gravy begin to bubble. 10. Turn off the heat and transfer the vegetables into a serving dish.